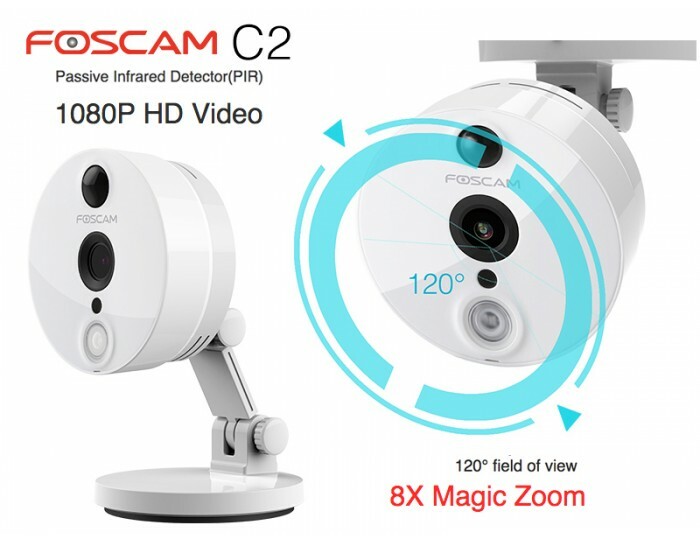 De Foscam C2 IP Camera offer 1080P Full HD streaming video for your computer or smartphone. So you can keep an eye on your house at all times. The C2 has Passivw Infrared Detector (PIR) that detects body heat and filters the unnecessary movement so no false alarm is triggered. You will get a message if the C2 detects something. De 8X Magic Zoom of the C2 offer tge same effect as an optical zoom with a fixed focus lens. The sleek design of the C2 allows the camera to be easely installed, on a table or suspended from a ceiling, with an ultra wide viewing angle of up to 120°. Now you can save all the important moments and memories on your C2 with the Foscam Cloud Service.